1. Solution of Partial Differential Equations by the Boundary Integral Equation Method (BIEM). Ordinary differential equations. Partial differential equations. 2. Elastostatics. Governing equations and fundamental solutions. The Somigliana identity. Boundary integral equations (BIE). Integral representation of stresses. Boundary integro-differential equations (BIDE). Stresses on the boundary. BIE and BIDE for an anisotropic medium. Axisymmetric problems. Semi-infinite problems. Numerical implementation. Numerical examples. 3. Elastodynamics. Equations of motion. Fundamental solutions. Integral representations of displacements and stresses. Boundary integral and integro-differential equations. Numerical solution. Alternative formulation of boundary element method. Numerical examples. 4. Thermoelasticity. Governing equations. Fundamental solutions. Integral representations of displacements and temperature. Integral representations of temperature gradients and stresses. Boundary integral and integro-differential equations. Numerical implementation. Alternative BEM formulation. Application to fracture mechanics. Numerical examples. 5. Micropolar Thermoelasticity. Equations of motion. Fundamental solutions in three dimensions. Fundamental solutions for plane problems. Fundamental solutions for antiplane problems. Integral representations. BIE and BIDE. Applications to fracture mechanics. 6. Elastoplasticity. Governing equations. Boundary integral formulations. Elastoplastic stress-strain relations. Incremental computations for elastoplasticity. 7. Viscoelasticity. Rheological models and the correspondence principle. Boundary integral formulation. Schapery's inversion algorithm. Application to fracture mechanics. 8. Thin Elastic Plates in Bending. Governing equations in classical plate theory. Integral formulation. Numerical solution. Large deflections. Berger equation. Plates on elastic foundations. 9. Stress Analysis by Hybrid Methods. Computation of stresses at internal points from stresses on boundary. Combination of BIE with holographic interferometry measurements. Hybrid method in fracture mechanics. Appendices. References. Subject Index. The boundary element method is an extremely versatile and powerful tool of computational mechanics which has already become a popular alternative to the well established finite element method. 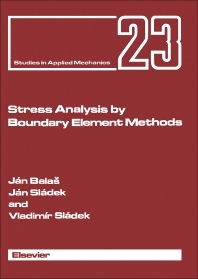 This book presents a comprehensive and up-to-date treatise on the boundary element method (BEM) in its applications to various fields of continuum mechanics such as: elastostatics, elastodynamics, thermoelasticity, micropolar elasticity, elastoplasticity, viscoelasticity, theory of plates and stress analysis by hybrid methods. The fundamental solution of governing differential equations, integral representations of the displacement and temperature fields, regularized integral representations of the stress field and heat flux, boundary integral equations and boundary integro-differential equations are derived. Besides the mathematical foundations of the boundary integral method, the book deals with practical applications of this method. Most of the applications concentrate mainly on the computational problems of fracture mechanics. The method has been found to be very efficient in stress-intensity factor computations. Also included are developments made by the authors in the boundary integral formulation of thermoelasticity, micropolar elasticity, viscoelasticity, plate theory, hybrid method in elasticity and solution of crack problems. The solution of boundary-value problems of thermoelasticity and micropolar thermoelasticity is formulated for the first time as the solution of pure boundary problems. A new unified formulation of general crack problems is presented by integro-differential equations.